To be considered the best, one must meet specific criteria. In some circles, to be named ‘best in show’, entrants must achieve ‘the standard of perfection’! 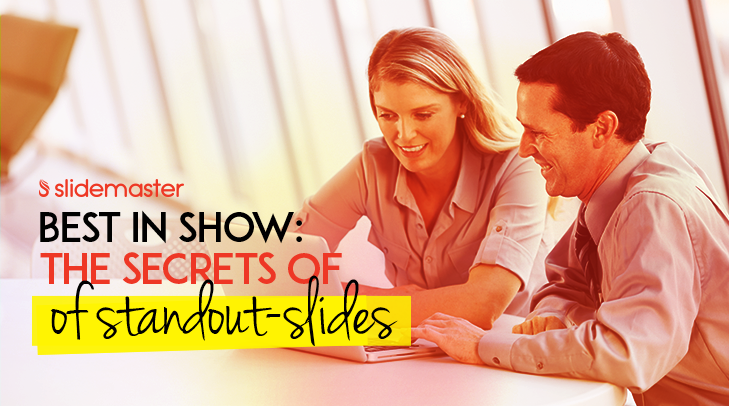 We don’t believe perfect slides exist, but we do love great-looking ones that captivate audiences. That’s why we recently introduced our ‘Slide of the Week’ series, where we pick one standout-slide of the many we see here at Slidemaster. It can be tempting to just select a stock template, but that’s never a good choice. Often, these are unattractive and overused. Besides, you are better off using a clean and simple design that you create yourself. The rest of the tips in this article can help you with specific elements, but the main idea is to go for plenty of white space and keep it simple. Bullets kill. That goes for your presentation slides too. The danger of bulleted lists is that they are easy to overload. So, avoid bullets altogether. Be selective of the words you highlight and remember you don’t need to include every single word you’ll say—just the important ones. Avoiding bullets equals clean slides that are focused on your main point. Your slide should represent an idea, not double as a photo gallery. As with the words that end up on your slide, be selective of graphics as well. Use high-impact, good-quality photos that help to get your point across. A well-chosen image often means no text is required. Clean, simple, standout! Colour can stir up emotion, motivate and even affect retention. There’s no need to learn colour theory in-depth, but some basics will help. Try to use a primary colour as your main colour and support it with just one or two others (ideally white, grey or black). If you have them, stick to your brand colours as this will make things even simpler. Good design is friendly on the eye. Not surprisingly, the font you use helps reduce eye strain. For slides, sans-serif fonts work best as the absence of the little ‘flourishes’ make it easier to read on-screen. If you keep your slides clean, select good images and text, and use colours and fonts wisely, you’ll end up with ‘best in show’ slides every time. Do your slides need a make-over? Let Slidemaster’s team of experts give them the professional touch-up they deserve. We’ll deliver a mix of carefully-selected colours and graphic elements that represent your style and captivate your audience. Contact us today for an obligation-free quote. To get you started, simply click here to access your free PowerPoint template.